The play "Yoshitsune Senbon Zakura" was originally written for the puppet theater (Bunraku) and staged for the first time in the 11th lunar month of 1747 in Ôsaka at the Takemotoza. It was adapted for Kabuki the following year and staged for the first time in the 1st lunar month of 1748 in Ise with Kataoka Nizaemon IV (Tokaiya Ginpei, Yokawa no Zenji Kakuhan) and Yamamoto Koheiji (Tadanobu). It was performed for the first time in a city licensed theater in the 5th lunar month of 1748, in Edo at the Nakamuraza [casting]. The "Daimotsu no Ura" scene is the fourth scene of the second act of "Yoshitsune Senbon Zakura". They are either staged independently of the rest, along with "Tokaiya" and "Funayagura", of the play or as part of a tôshi kyôgen production of "Yoshitsune Senbon Zakura". Suddenly the gravely wounded Tomomori reappears. He challenges Yoshitsune to fight him to the death, but Yoshitsune refuses, instead praising Tomomori for his bravery and loyalty in protecting the Emperor. Yoshitsune vows that he will take care of the Emperor in Tomomori's stead. Benkei attempts to persuade Tomomori to free himself from earthly passions and become a Buddhist priest, but Tomomori says that whether dead or alive, he can never be freed from his resentment against the Genji clan. The Emperor, child though he is, recognizes Yoshitsune's good will and asks Tomomori to forgive him. 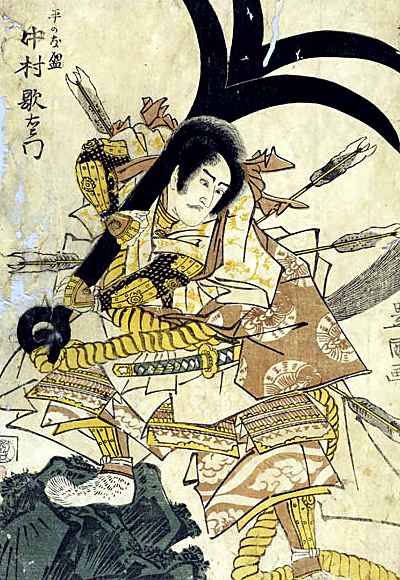 Suke-no-Tsubone also begs Yoshitsune to keep his promise to protect the Emperor, and then takes her life. Tomomori has not been unmoved by their pleas. He says that all this misfortune has been the result of the evil karma sowed by his own father, Kiyomori. Begging Yoshitsune to believe that it was not Tomomori himself, but his resentful ghost, that attempted to avenge itself on him, Tomomori ties himself to an anchor, and jumps into the sea.